When I try to install "UnitySetup-Vuforia-AR-Support-for-Editor-2018.1"
I followed the exact steps you mentioned and still getting that error. 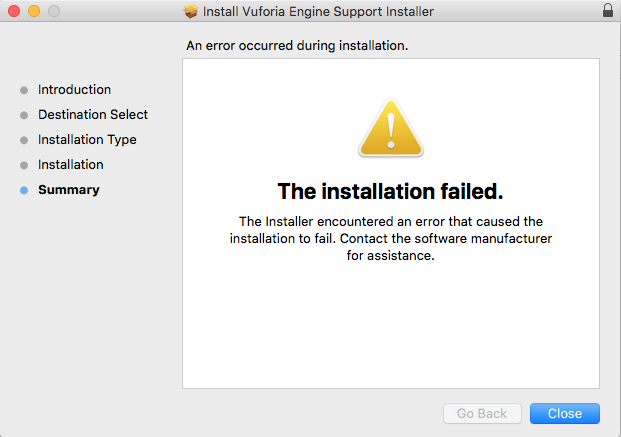 I am trying to install the Vuforia 8.0 update to Unity 2018.3 on mac OS High Sierra. 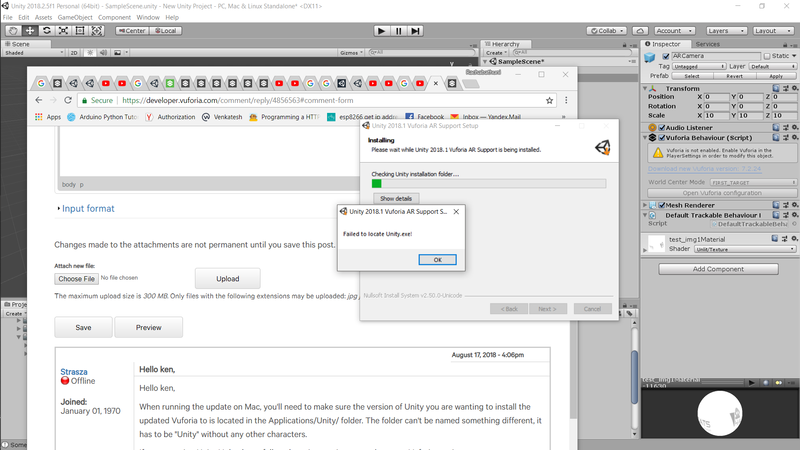 I have the Unity app folder on a different partition than the sistem. I keeps faling after writing the files. It works for the Mac. I've heard of issues when using drives that are mapped via USB and/or network locations, but I've yet to be able to replicate. Getting Same error when trying to install Unity 2018.2 Vuforia AR Support. It says it will install it in the following folder... but that is blank. When you choose a folder it then fails saying it can't locate Unity. What folder should this be installed into?? Running windows 10 with latest version of Unity. My Unity is installed in "C:\Windows\Program Files\Unity"
Unity.exe is located in "C:\Windows\Program Files\Unity\Editor\Unity.exe"
I have tried to select both "Unity\" and "Unity\Editor\" but to no avail. Can you show me what folder you are selecting to install this to when this error appears? When running the update on Mac, you'll need to make sure the version of Unity you are wanting to install the updated Vuforia to is located in the Applications/Unity/ folder. The folder can't be named something different, it has to be "Unity" without any other characters.